When a computer is first switched on it reads the Basic Input Output System (BIOS) memory. Code in the BIOS instructs the computer to search drives for the Volume Boot Sector. The Volume Boot Sector defines the drives partitions. The partition defined as the Master Boot Sector (MBR) contains the partition table which identifies the BOOT SECTOR (the partition that is active and bootable). In Windows operating systems previous to Vista, the MBR looks in the BOOT SECTOR for the file NTLDR (New Technology Loader). NTLDR reads the file boot.ini. Boot.ini contains variables which specify which operating systems are available, the default operating system and how long to wait before loading the default operating system. The boot sequence of Windows Vista and later systems is slightly different from previous versions. For Windows Vista, the MBR instead loads the Windows Boot Manager (BOOTMGR), which accesses the Boot Configuration Data store (BCD). The BCD (boot.wmi.dcd) is located in \Boot\Bcd on the system volume. The BCD is formatted the same way as a Windows registry. Information in the BCD is used to load the operating system. The BOOTMGR and BCD replace NTLDR and boot.ini that were used in previous systems. The BCD contains data that provides options similar to boot.ini, along with options to boot Windows by invoking winload.exe, options to resume Windows from hibernation, and options to boot a previous version of Windows by using NTLDR. Because the BCD is not a smple ASCII text file as was boot.ini, it must be edited using a utility. The BCD may be edited using the command-line tool bcdedit.exe which is included in Windows. To use BCDEdit, you must be a member of the Administrators group on the computer. The BCD can also be edited using the free EasyBCD application. 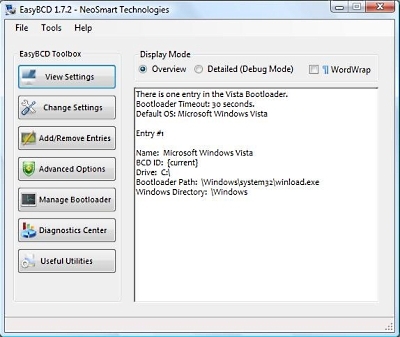 With EasyBCD it's possible to switch between the Windows Vista and Windows XP bootloaders (BOOTMGR and NTLDR) in the MBR from within Windows by simply clicking on a button. EasyBCD also has features that can be used to backup, restore, or repair the BCD. Programmers can access the BCD through the Windows Management Instrument (WMI) interface to change boot options programmatically.